Ken Akamatsu talks about his favorite parts of the Love Hina manga and his limited role in the anime adaptation. His answer as to why he wasn’t able to get involved with the adaptation (that weekly manga made him too busy) is an interesting contrast with DN Angel’s Yukiru Sugisaki, who published monthly and was heavily involved in the adaptation. 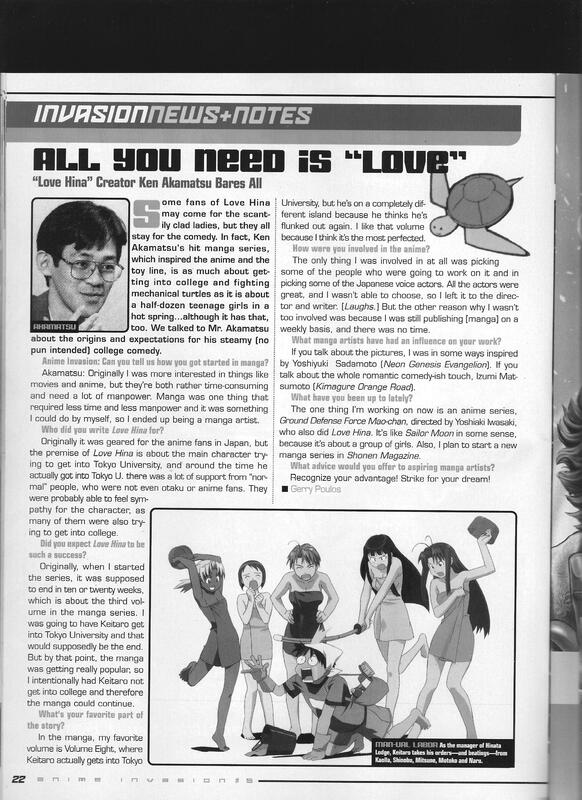 This entry was posted in Old Magazine Articles and tagged Borderline Plagarism for the Freedom of Information, Ken Akamatsu, Manga by torisunanohokori. Bookmark the permalink.